Finally a station was built in 1899 at the cost of £335 13s 2d. It was used as the constable’s residence with the office on the verandah. Later the ‘station’ was in the courthouse and then in a room at the Old Drill Hall in Fort Street. 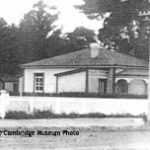 The Waikato Independent reported in April 1939 that the Commissioner of Police, D J Cummings, was a visitor to Cambridge and arrangements were made for the erection of a new police residence adjoining the courthouse in Victoria Street. The Victoria Street station was built in 1954, the old ‘house’ being removed to Tauwhare in September 1966. An incident that Constable Ned Kelly remembered in regard to the station was when a swarm of bees got into the ceiling of the ‘lockup’ and they had a heck of a job getting them out.